We do hope that you never run into a situation that needs a Public Adjuster but if you have to file a claim with your insurance company you should have someone in your corner. Once you have decided to file a claim there are many questions about how a Public Adjuster can help, what they do for you and where do they fit in the process. Well below we will answer a few of those questions. Why do I call Ivy? Will it be expensive to hire a Ivy Public Adjustment? No. Public Insurance Adjusters work for a small percentage of your claim settlement and require no up front fees. The fee is payable after your claim is settled and you have been paid by your insurance company. Retaining the services of Ivy Public Adjusting will almost certainly increase your claim settlement, and usually the fee for those services will be more than offset by your larger settlement. My agent says my insurance company uses an independent adjuster. Is an independent adjuster the same as a public adjuster? No. An independent adjuster is a sub-contractor hired by the insurance company to do a job that might otherwise be handled by an in-house adjuster. Just like the in-house adjuster, an independent adjuster represents the insurance company. A public adjuster is your advocate, representing you, the policy-holder. Why do I need Ivy Public Adjustment to obtain what is rightfully due me? Preparing an insurance claim can be a complicated and complex task. There are just too many details and variables which arise that can be easily overlooked. The decision to use a Public Adjuster has very little to do with whether or not you believe the insurance company will or will not try to be fair. Public Adjusters will almost always obtain much greater settlements than individuals, not only due to their skill in evaluating, estimating, and appraising, but also because of their experience with the “ins and outs” of the insurance industry. As is true in any profession, the more experience and training one has, the better the final results. The State of Florida recently released the results of an extensive investigation, and found that public adjusters, on average, obtained more than 500% than what Citizens Property Insurance Corporation tried to settle their claims for. Am I guaranteed a larger settlement by using Ivy Public Adjustment? Almost always. The more thorough and complete your claim, the higher the settlement. In fact, in the recent Oppaga Report, the State of Florida released the results of an extensive investigation, and found that public adjusters, on average, obtained more than 500% than what Citizens Property Insurance Corporation tried to settle their claims for. Do I have to pay Ivy up front? No. We are not paid until money is collected from the Insurance Company. In fact, we spend our money and our time helping to document and process your claim before we are paid anything. Also, it is illegal for any public adjuster to charge any kind of advance in the State of Florida. Who can/does use Ivy Public Adjustment’s services? Public Adjusters are utilized by individuals and all types of businesses and professions, including banks, accountants, attorneys, and even insurance adjusters and agents on their own losses. Once a person has experienced the benefits of our services, they will rarely attempt to settle a claim without our assistance. Why can’t my agent make sure I get a fair settlement? You probably bought your insurance from your agent or broker because of his friendship and/or salesmanship. While the agent’s expertise is in connection with the marketing of insurance policies, he or she does not have the experience nor the obligation to render adjusting services. In fact, we have seen many times where the insurance company demanded that the agent stay out of the adjustment process. They were told to mind their own business. When everything is said and done, agents cannot do much to help, and they are just wrong if they suggest otherwise. Many people are shocked when they learn that most agents are paid an annual bonus if their claims are kept below a certain percent, known in the industry as the profit/loss ratio bonus. This naturally creates an undisclosed conflict of interest. With the agent having a personal financial interest in your claim, the more he or she helps you, the more he or she hurts himself or herself. However, agents who are aware of our professionalism and expertise, and who have the interest of the Insured at heart, will never discourage them from employing our services. In fact, they often highly recommend us, as they, themselves, have utilized our services many times after being a victim of a loss. Beware of anyone who advises you not to seek assistance from someone with our successful track record who works exclusively for you and your benefit. If I employ Ivy to assist with my claim will it cause problems or delays? The vast majority of our claims are conducted and concluded in the spirit of professionalism and mutual respect with the insurance company’s representative(s). However, if the company does not want to be reasonable, we will never under any circumstances capitulate to any unreasonable demands or positions they take. If there are any problems or delays in your claim, they are the same problems which would exist whether or not we are involved. We, however, because of our experience would know the best way to minimize certain problems or delays, and often, just by our involvement, many problems are avoided before they develop. While some unethical adjusters may discourage you from employing a Public Adjuster (who is licensed by the DFS), statistics are quite clear that Public Adjusters, almost without exception, assist in obtaining extremely higher settlements for the Insured, not to mention the time and turmoil the Insured is saved. It is beyond dispute that if any adjuster or agent prefers that you do not hire a Public Adjuster, it cannot possibly be your interest they have in mind. 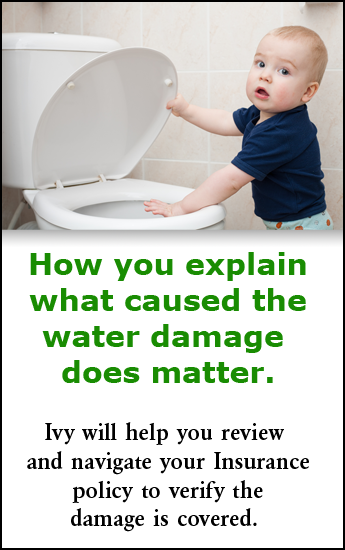 Should I wait for the insurance company to make an offer to know if I need to call Ivy? If you are substantially under-insured and it is likely that you will obtain the limits of your policy, then, of course, you should wait. In situations like that, that is always our advice to you. However, many people make a serious error by delaying the employment of professional assistance. The earlier we are involved in a claim, the smoother the adjusting process generally proceeds. The insurance company often will not take certain positions when we are involved that they may try to take when we are not. In addition, it takes a great amount of work to determine exactly what is fair, and most people simply do not have the necessary expertise to determine whether or not a company’s offer is fair and accurate. Sadly we see many people who handle their own claims accept what we know are clearly low offers (sometimes less that 50 cents on the dollar), and yet are still quite happy with the settlement. We have also found quite often that the longer a person waits, the more stress and duress he or she is under. Every day many people accept substandard offers just to get the bad experience over with. This is not the best position to be in when you try to negotiate your claim. Bad settlements need not happen. Will my insurance company cancel me if I hire Ivy to fight for me? No. The public adjusting profession is mandated by the Legislature and regulated by the DFS. It would be a serious violation if any Insurance Company would discriminate against you in any way for exercising a right given to you by the State Legislature. Why hire a member of MAPIA? When you hire a member firm of Mid-Atlantic Association of Public Insurance Adjusters (MAPIA), you are hiring a Public Adjusting Company that upholds the high ethical standards set by MAPIA. All member firms are dedicated to providing a high level of professional service to its clients.